Two school leaders share their solutions to challenges including outside noise, lack of space and where to use the bathroom. Every day in the U.S., hundreds of thousands of teachers go to work in portable classrooms. These teachers and their students face challenges such as limited space and difficult access to bathrooms. With less-than-ideal acoustic design and all sorts of outside noise leaking in, students in portables can also have difficulty hearing everything the teacher says. Teachers, meanwhile, sometimes find themselves disconnected from the rest of the school. Here, a principal and a district director of technology share their solutions for making sure that every student in every type of classroom has equal access to quality education. Freewater serves a diverse range of students in grades four and five. We have a total of 290 students, and we have high expectations for each and every one of them. We’ve received the state “excellence” award twice in the last four years. 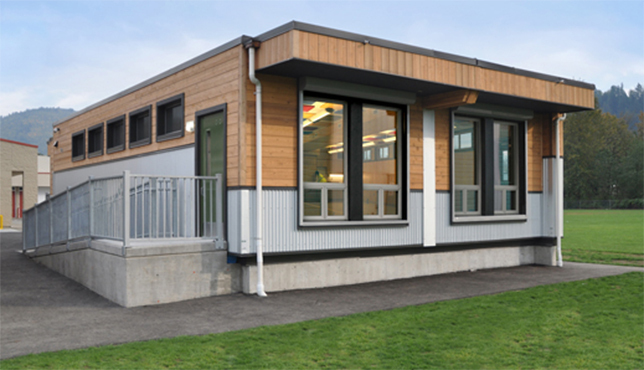 When we decided to replace our old, out-of-date school building, we determined that portable classrooms were the best and most timely solution to meet our needs. Today, two-thirds of our classrooms are portables. Our teachers have banded together to get creative about effectively using the small space they’re provided. The classrooms are generally configured into zones that have student desks, a teacher workstation, a teacher/group station, and a book-reading nook. With space limited, teachers have found that they need to be very clear when directing students in the procedures of the classroom. 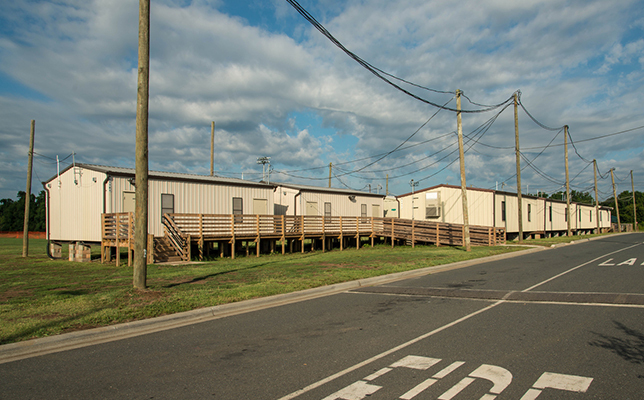 Our portables get more noise from outside than traditional classrooms, because they are placed in rows 15 feet apart to meet our space needs. Noises coming in from the outside like people walking on the concrete sidewalks, teachers welcoming students to neighboring classrooms, and doors closing can be loud and distracting to students in these classrooms. The need for better hearing in the portable classrooms was particularly important for educators teaching English as a second language, reading intervention, and special education classes. When we toured other school districts to learn about possible solutions in use, we found out about the Lightspeed Redcat Access portable audio system, which includes a wearable microphone and a wireless, flat-panel speaker. The system fills the room with the teacher’s natural voice, overcoming the background noises. Using funding from the school’s technology budget, we purchased systems for every teacher. Teachers now have more energy because they don’t have to speak up all day long, and students engage with the class more because they can hear every word the teacher is saying. Getting students to and from classes outside the main building has been a challenge, too. We have covered walkways that help when we have rain or bad weather, and a solid system for students entering and exiting the main building and outside classrooms. Additionally, each modular has its own bathroom so students don’t have to leave to a central area for that. One of the unforeseen issues with portables is the loss of hallway bulletin board space or shared space for other classes to see what students are doing. This has been an ongoing struggle, and we now use areas like the cafeteria to display student work. Another unexpected issue is teacher seclusion. Portables can make you live in your own area and not realize it. We encourage our teachers to go to another part of the building each day or check in with another teacher. Portables can be a good short-term solution to compensate for increased student enrollment, but they are not a good 10-year plan. Tahoe Truckee Unified School District encompasses 12 campuses in northeastern California. Providing all our elementary, middle, and high school students with equal access to quality education is one of our top priorities as a district. We also want to ensure that each and every student is college- and career-ready by the time they graduate. Access to state-of-the-art technology plays a big role in our efforts to accomplish this. Apple TV and Google Chromecast, among other components. Our modular classrooms presented additional challenges that our technology package addressed. In a portable classroom, sound is absorbed and not delivered clearly unless the teacher is directly facing the student. Additionally, our teachers like to move around to interact with student projects and teams, and often turn to whiteboards and visual displays. Their voices are then directed away from the class, and visual cues are reduced. The audio system helps solve the acoustic challenges for our portables and allows all students to hear equally throughout the classroom while reducing teacher voice strain. With space being at a premium, we also recommended removing any “built-in” casework/whiteboards that restrict the classroom into one single configuration, and replacing the casework with mobile storage units. Students in grades 3 to 12 are equipped with 1-to-1 devices, which is a contributing factor in dramatically reducing the amount of storage needed for printed materials, since students can access content online through their devices. Flexible classroom design is important to our goal that any student can sit anywhere — in any portable classroom as well as any traditional one — and have equal access to learning.